We did not scout this farm this spring but, saw and heard turkeys on each of our fall bow-hunts last year. We set against the base of trees big enough to break up our outline. At day light turkeys were gobbling in every direction. We probably heard at least five different birds. My wifes bird was in a group of three. They were traveling through a huge bottom field gobbling every now and then. She sat up at the end of the field in the woods. Dad was behind her calling very little. Just enough to keep their attention. It took about 45 minutes to an hour for them to get into gun range. She took the bird at 25 yards or less with a 20 gauge youth model Remington 870. It was her first bird. My son and I were about a 1/2 mile away and could hear her excitement. She dropped him on the spot. It was a jake with 1/4 inch spurs, a 5 inch beard, and was about 17 pounds. 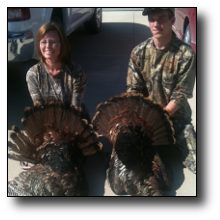 My son and I worked multiple birds that morning and had two come very close but because of the lay of the land, we couldn't see them. They stopped gobbling not too long after we heard my wife score and we walked in the direction we heard birds gobbling earlier. After a long walk and call trip we crossed a small field. While crossing the field we had a gobbler come to the edge of the timber and take a look around. At the same time, a large Whitetail deer was right beside it. We continued on to the woods at the end of the field, setup and called. A turkey gobbled less than 100 yards from us. 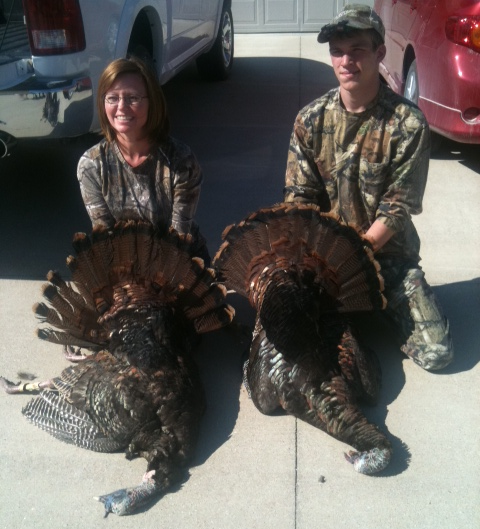 We immediatly worked him and in less than 2 minutes my son shot his bird at about 35 yards. The bird flopped a little but went nowhere. It was also a jake, almost identical to my wife's bird.